Idlis and dosas fall in the fermented food category. The urad dal & fenugreek seeds South Indian cuisine is almost synonymous with idli! 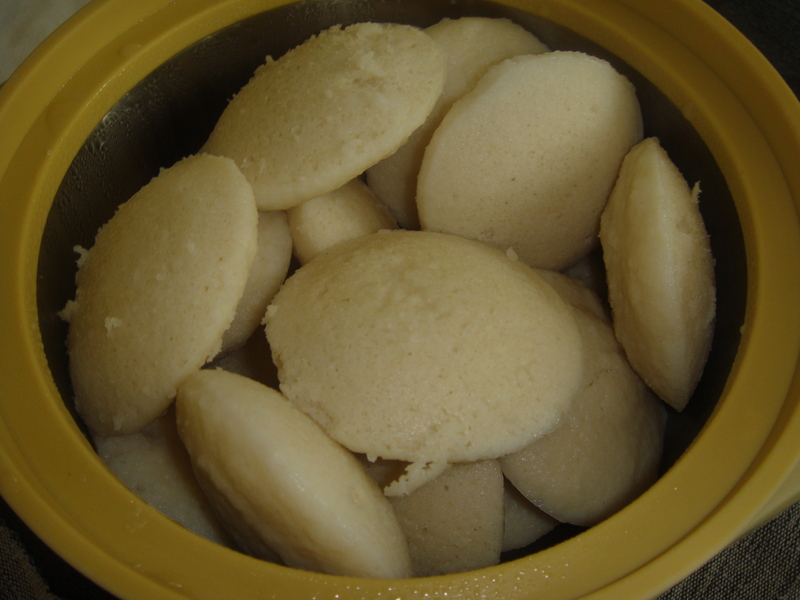 idli is not only easy to make but also extremely healthy and easy to digest. In fact, when stranded on a highway with nothing to eat, people wouldn’t hesitate to walk into a roadside hotel and buy a few idlis, as it is steamed, and therefore quite safe to eat anywhere! Wash and soak the urad dal with fenugreek seeds and rice separately in sufficient water overnight. Drain and blend the urad dal and fenugreek seeds in a mixer, adding water slowly as required,till smooth and frothy . Remove it in a big mixing bowl and keep aside. Drain and blend the rice in the mixer till smooth. Remove and keep aside. Combine the urad dal and rice paste together in the mixing bowl . Cover and keep aside to ferment overnight. After the batter is fermented, add salt to the batter and mix well. Take the Idli mould, fitting in your pressure cooker, ( in five liter capacity pressure cooker, we have an Idli mould for making sixteen Idlis in one batch) . Grease the moulds with oil. Put spoonfuls of the batter into greased idli moulds. When the mould is filled with batter, place it in the pressure cooker with 3 cups of water. After closing the pressure cooker lid, place the cooker on a medium high flame, (without the weight) when steam starts coming out , note the time and cook for 12 minutes. Switch off the stove. Keep it standing for five minutes. Open the lid and carefully take out the Idli mould from the pressure cooker. Let it cool for 7-8 minutes. After the Idli mould is outside for five minutes, remove the idlies one by one from the moulds with the tip of kitchen knife in to a serving bowl. Repeat the process with the remaining batter to make more idlis.